Some movies have the same recipe and are the same generic garbage. The piece of “popular culture” I’d like to talk about is stupid movies. Specifically the 2010 movie Grown Ups and the 2013 follow up movie quaintly titled Grown Ups 2. 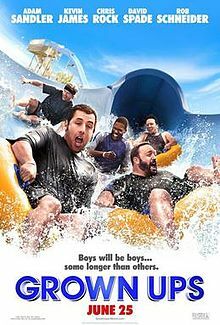 Grown Ups stars comedians Adam Sandler, Kevin James, Chris Rock, David Spade, and Rob Schneider (although Schneider did not reprise his role in the sequel). The first movie follows the group as they reunite at a funeral having not seen each other in over 30 years. However, Grown Ups was panned by critics receiving only a 10% on Rotten Tomatoes. The movie was chastised for bad plot, terrible script, and for not being very funny. Schneider was even nominated for the Razzie Award for the Worst Supporting Actor for his role. Why then did they decide to make a sequel to a movie that had no artistic merit? Well Grown Ups was a big box office success grossing over $270 million worldwide (Box Office Mojo). As Horkheimer and Adorno say, “Movies…are just business…made into an ideology in order to satisfy the rubbish they deliberately produce” (40). It does not matter that Grown Ups is terrible, the simple fact is the movie made money. A LOT of money in fact! Therefore the masses spoke resulting in a sad commentary on the movie industry for taking the position that money is king and intellect is unnecessary. Not surprisingly, this summer’s Grown Ups 2 received even worse reviews, garnering only a 7% on Rotten Tomatoes. While the movie may be bad and stupid, the public flocked to see it again. Grown Ups 2 grossed over $213 million worldwide (Box Office Mojo). Why did people go to the bad follow up of a bad movie? Because Grown Ups 2 followed the same formula of its predecessor. The sequel was “firmly stamped with sameness” (44). Simply put, the stars did what was expected of them. Everyone read and performed their lines, sometimes (more like rarely) they were funny, and audiences came to see a movie they knew would offer a couple laughs. Once again the lack of intellect was heightened because some people want to be spoon-fed the material. Both Grown Ups movies require “no independent thinking…from the audience; the product prescribes every reaction” (48). Even by watching the trailer for the sequel the audience can see how “Any logical connection calling for mental effort [will be] painstakingly avoided” (48) by watching a film where one of the funniest parts is when a deer pees on Adam Sandler. Grown Ups one and two show how there is still a market for cheap, stupid amusement entertainment known as “the antithesis of art” (50) where no intellect is required to enjoy. But if the movie is a box office success that means people came and someone got pleasure out of the movie. Even though sometimes pleasure “means not [having] to think about anything” (51). But now the big question is: does success warrant a Grown Ups 3? Apparently there is a market for one but please please no. and then they’ll make one more!